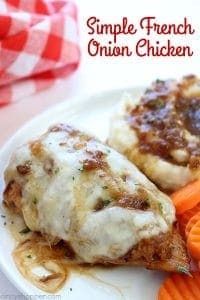 If you are a fan of French onion soup, you will want to make this Simple French Onion Chicken for dinner! 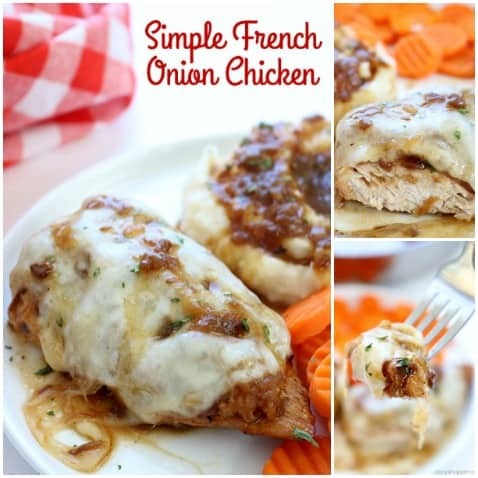 We use simple ingredients to load up chicken breasts with amazing onion flavor. The hubby and I are HUGE fans of onions. 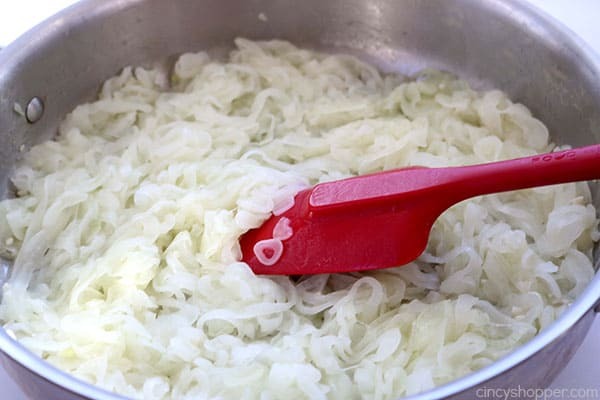 We add onions to just about every single main dish we make. The kiddos on the other hand can spot an onion a mile away. So, usually we will puree the onions so they do not even notice them, ha ha. We often ask each other “how can they not like onions?” We just can not understand it because we LOVE them. 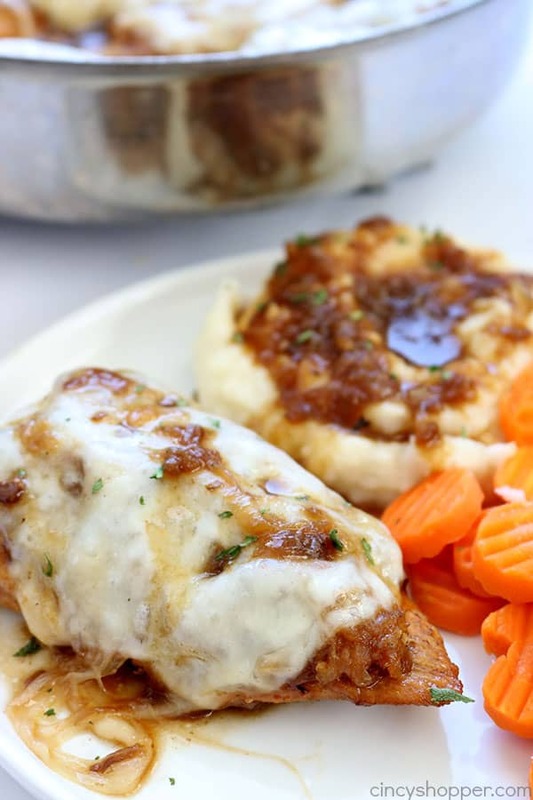 This chicken breast dinner was all for mom and dad. We say the heck with them occasionally and make recipes they might night care for. Yes, we need to satisfy our own cravings too! 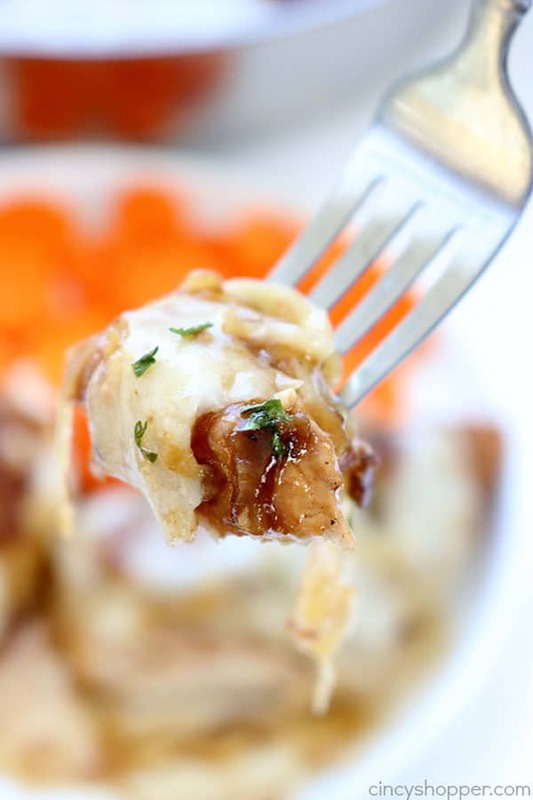 We love French Onion Soup. We have used the cans of French Onion Soup that are labeled “Great for Cooking” in our Simple Beef Tips that we shared with you on the blog. The soup makes for a great gravy when combined with a slurry. The kids could eat around the onions in that recipe. 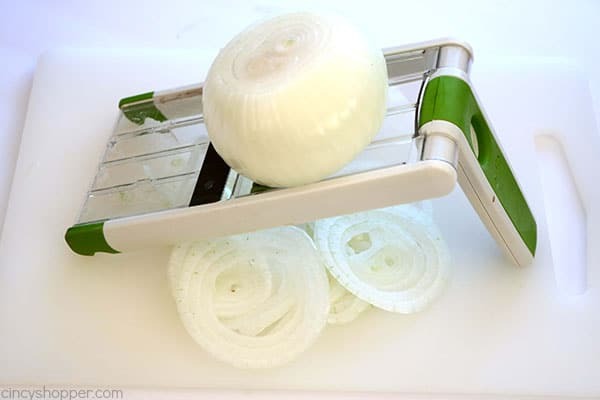 This recipe on the other hand is LOADED with fresh sliced onions. There is no eating around them. Perfect for mom and dad, lol. My family gets bored with chicken. I am always needing to think of new chicken recipes to keep their interest. 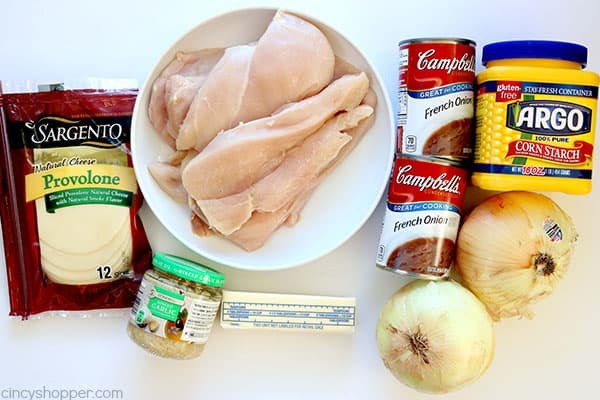 I usually end up making our Easy Chicken Pot Pie recipe or our Red Hot Chicken on nights that I am making chicken. 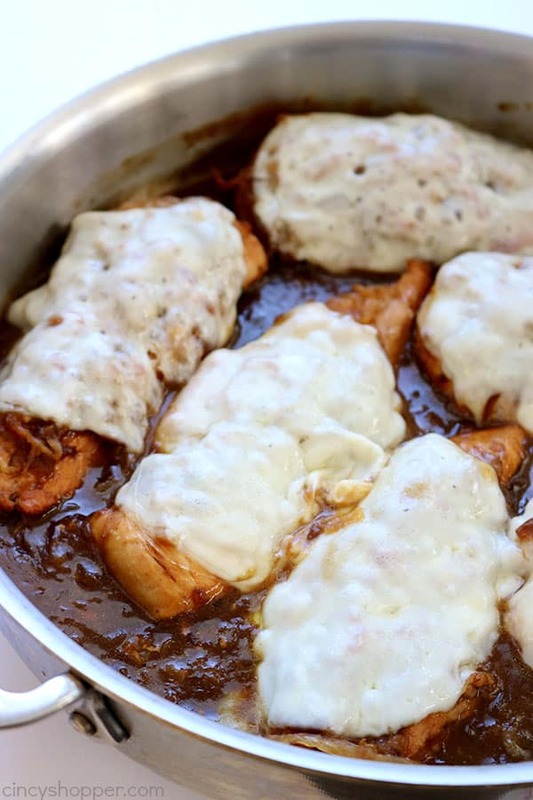 This recipe will for sure be added to our rotation. We added in mashed potatoes for a side dish. 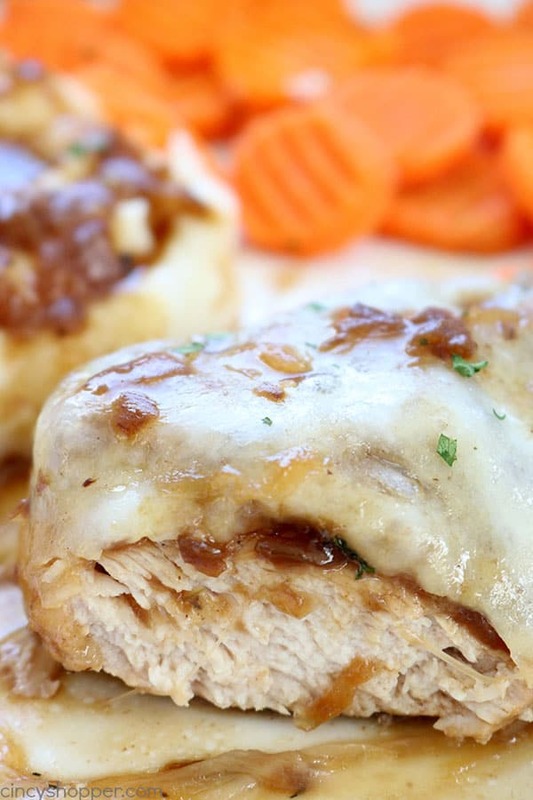 I think this recipe is perfect with potatoes that you can load the amazing french onion gravy on top. Makes for a comfort meal. Just add in your favorite vegetable. 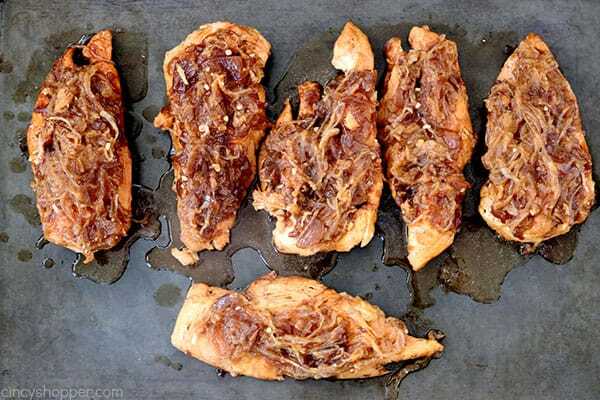 The recipe starts with boneless skinless chicken breasts. I actually cut ours in half so they would cook quicker. 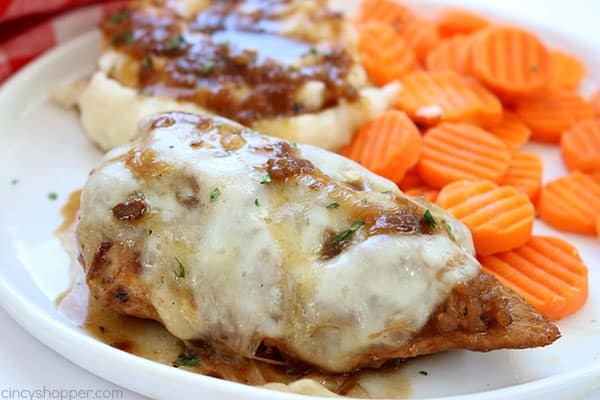 The idea is great if you are wanting dinner on the table a bit quicker. We used 2 large sweet onions. Vidalia onions are perfect for this recipe if you have them in stock at your grocery. 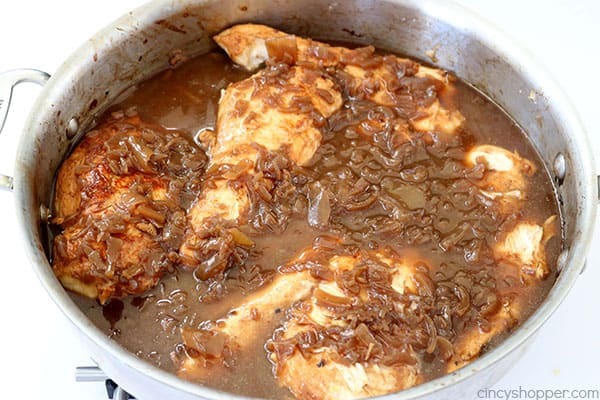 The French Onion cooking soup works great for the broth and making the gravy. We used Provolone cheese. 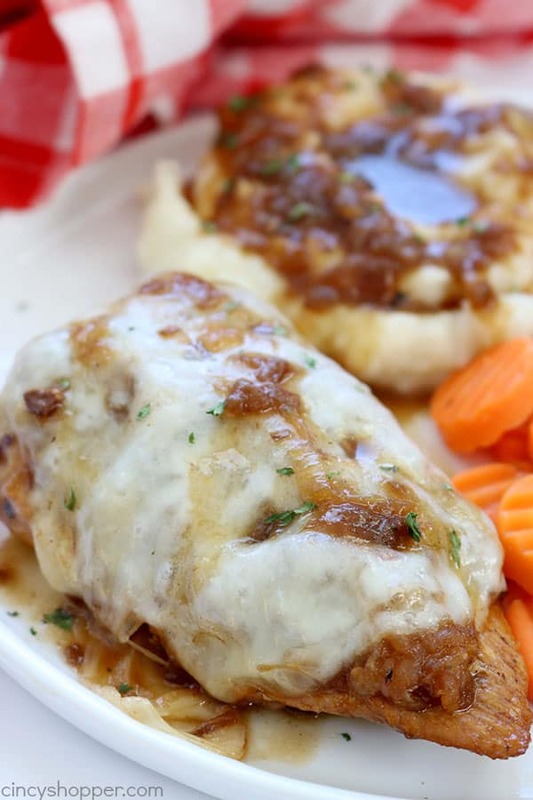 You could use Swiss cheese or just stick with Provolone like we did. 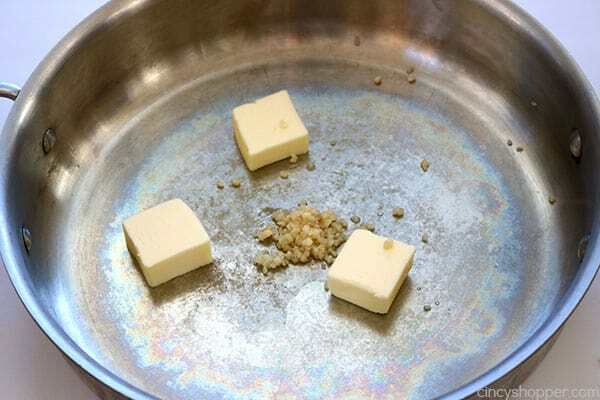 Add garlic and sliced onions to pan and cook until lightly carmelized. 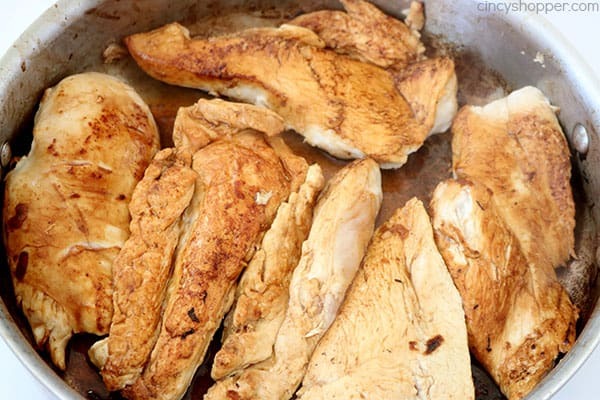 Cook chicken breasts for about 5 minutes on each side. 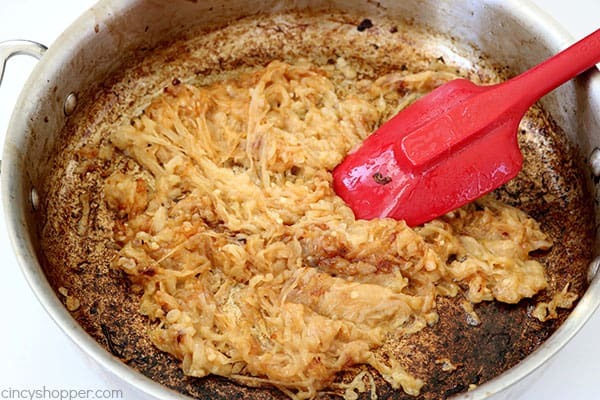 Add soup and return onions to pan and continue on medium heat for 20-25 minutes. Remove breasts and place on baking sheet. Top each with a slice of provolone and broil until melted. 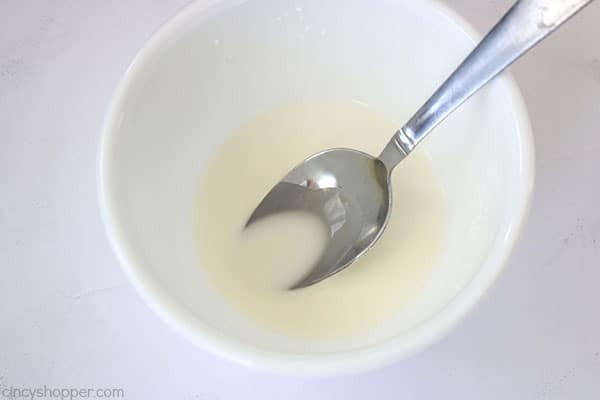 Stir together cornstarch and water to make a slurry and add to pan, stirring until blended. 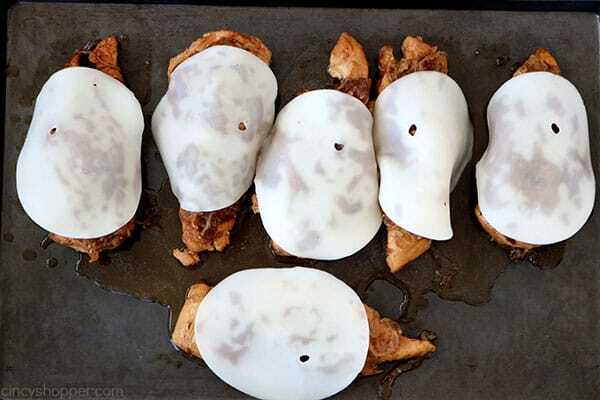 Return breasts to pan until ready to serve. 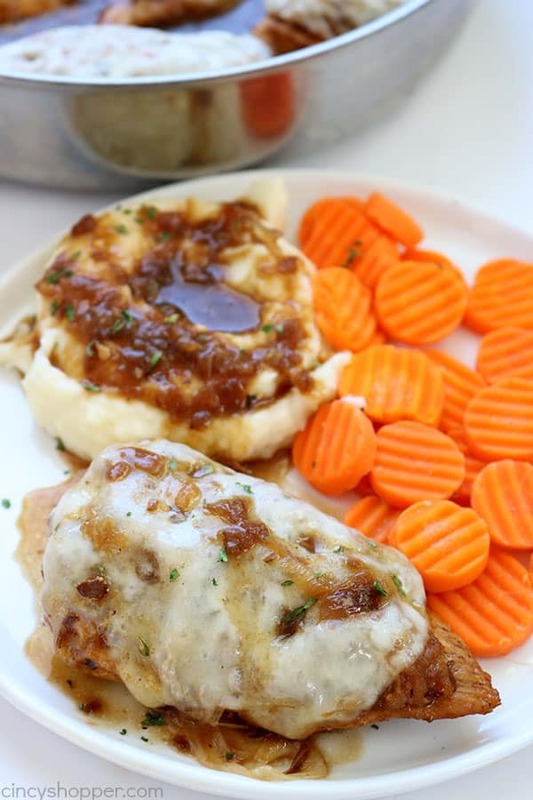 Do you have a favorite chicken breast dinner that you make for your family?